It’s no secret that everyone loves bacon. But brussels sprouts? File that relationship under “It’s Complicated”. Brussels have a lot of obstacles in making onto the mainstream dinner table. First of all, my parent’s generation is (rightfully) scarred from their parents deciding that boiling was the best cooking method. Um, Ew. I’m here to help everyone regain some trust in this veggie. 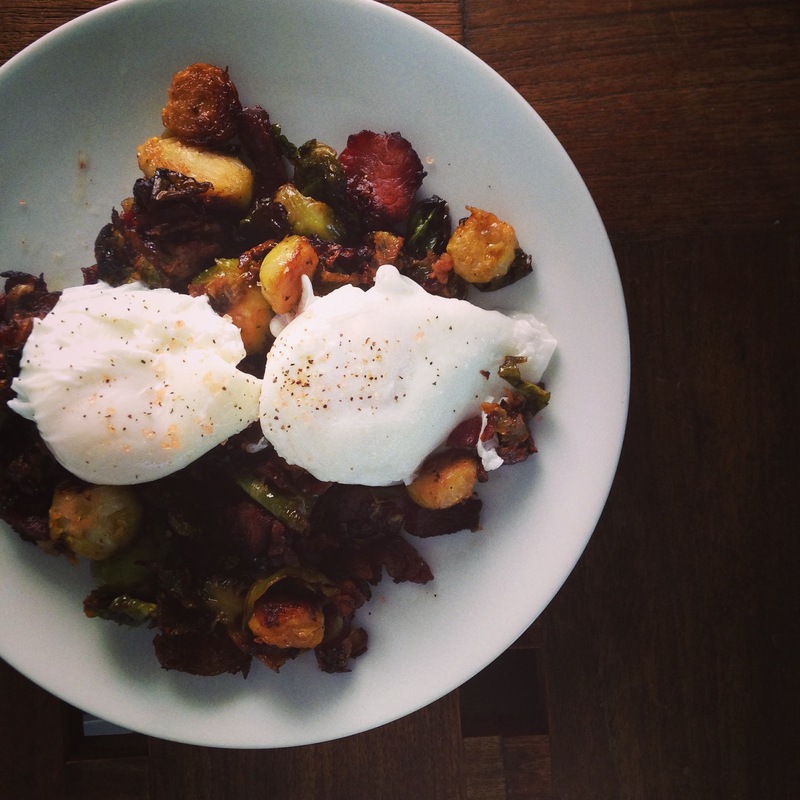 The truth is, brussels sprouts are freaking delicious. You just have to, as with most things in the culinary world, cook them correctly. Add some of that crowd-pleaser bacon and BOOM. You’ve initiated new members of the Brussels Fan Club. Top it with poached eggs and you’ll have a truly delicious and nutritious breakfast. *If you need help with poaching eggs, I include details in that step below or check out this awesome tutorial. Remove stem end from brussels sprouts and chop them into thirds. Begin to heat a large skillet over med-high. Chop bacon roughly and place in hot skillet. Stir bacon after a minute or so. Add brussels. Stir occasionally. Until bacon is cooked through. If there’s A LOT of bacon fat, you can drain the mixture. Add some salt and pepper to taste. (remember: the bacon is salty so don’t go overboard with the salt. Add a squeeze of lemon or some balsamic vinegar to the mixture while it cooks. This will help cut some of the fatty/oily texture. Remove brussels from heat and set aside. Crack your eggs (gently) into the hot water. Maybe 2-3 at a time. Remove with a slotted spoon after a few minutes if you like a gooey yolk. A little more if you want the yolk fully cooked. Check the yolk by picking up the egg with the slotted spoon and gently shaking the egg. The white will be solid but the yolk center will jiggle a little (or not if that’s your preference). We eat brussel sprouts every week! We just saute them in oil until they are crispy. We do this often with the shredded ones from TJs and it’s yum.